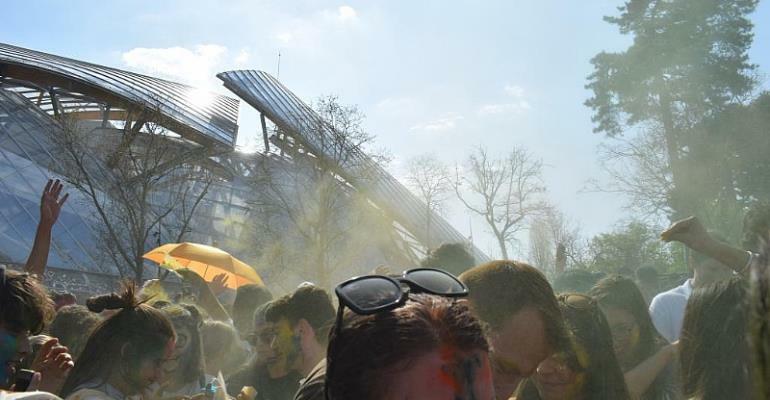 Happy Holi cries out the host at the main stage in Paris' Jardin d'Acclimatation. And with that, a cloud of colour fills the air as revellers throw bright powder in all directions to mark the Indian Holi Festival. Every year, Indians across the world, mark the joyous occasion with colour. And lots of it. It takes place more or less the same time each year – just before the first day of spring. But this year, that day fell on 21 March, which didn't suit organisers, so they pushed it back to 31 March. “Holi festival is a festival of colours,” explains Vivkl Tayal, the vice-president of GOPIO (Global Organization People of Indian Origin) Paris France, one of the organisers behind this year's event. According to one participant, it is a celebration of the victory of good over evil. The festival itself dates back centuries to ancient Hindu religious traditions that cut across society and castes in India. “There are many stories in Hindu religion. There's the story of Holika,” says Tayal, which is marked on the eve of Holi with a "Holika Dahan". It's a gathering around a large bonfire where people pray to have their inner evil burned away – the same way Holika, the sister of the demon king Kiranyakashipu was killed in a fire. “We are burning the bad things and we are also burning our bad habits,” adds Tayal. The festival itself marks an end to negativity while welcoming in the new, as in the spring, and the new harvest season that will begin. The colours likely symbolise the new flower blossoms and fragrance in the air.